Aww, geez. It looks like I’m having such a tough time telling where the Loonie’s headed because my latest trades didn’t work out too well. When Canada printed better than expected manufacturing sales figures, I decided to close my trade right away. The report revealed that manufacturing sales saw a 0.1% uptick in June, on top of the 0.5% increase seen last May. Even though Canada’s foreign securities purchases slumped in the same month, the Loonie didn’t slide down after the report since the US churned out a bunch of stronger than expected figures. By the looks of things, this seemed enough for investors to start risk-taking again. 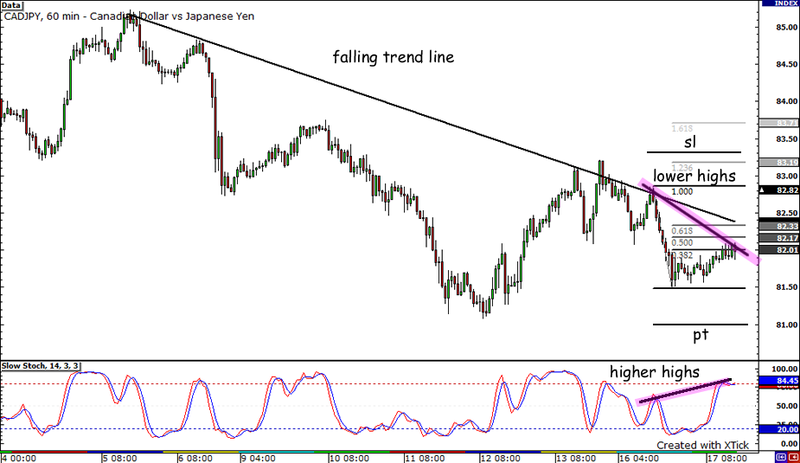 Because of that, CADJPY busted through the trend line I drew so I figured it might be best to just cut losses. Not such a good day for me then… I hope I catch a better trade opportunity this week. After all, it’s only Tuesday! I’m trying my luck with the Loonie again. I may have gotten burned on my recent Loonie trade because of weak Canadian data so this time, I’m gonna go short! Oh, I’m looking to play a cross pair too since the setup on CADJPY is too yummy to pass up. Hopefully, this works out. I got too giddy when I saw the resistance on the 0.5 Fib level hold and the pair close below the 82.00 handle. What made this trade even sweeter were the falling trend line and stochastics crossover at the overbought territory which confirmed that hidden bearish divergence. See that? Price is making lower highs but stochastics is making higher highs. So I entered at market and I priced in at 81.95. Yahoo! I’m hoping that resistance at psychological handle and the Fib levels will hold but just in case they don’t I placed my stop loss just above the previous highs at 83.30. I have two profit targets for this trade. First I’ll be aiming for the pair’s previous lows at 81.00 then I’ll be targeting the psychological 80.00 handle. Yeah, I know it seems such a long shot but who knows, little ol’ me might get lucky! Later on, Canada has a couple of economic reports due and both are expected to post weaker results compared to the previous months. Foreign securities purchases are projected to slide from 23.16 billion CAD in May to 9.42 billion CAD in June, reflecting how demand for Canadian securities waned during the month. Aside from that, Canada could report a 0.4% decline in manufacturing sales for June, erasing the 0.4% gain in the previous month. If the actual figure comes in negative, it would mark the indicator’s first decline in ten months. Yipes! Bad for the Loonie but good for my short trade! Meanwhile, the Japanese yen has been enjoying quite a nice run since investors are shying away from riskier assets. In terms of economic reports, the coast is clear for Japan for the next couple of days. Unless the risk appetite switch suddenly gets flicked back on, the yen could keep strengthening against its counterparts. 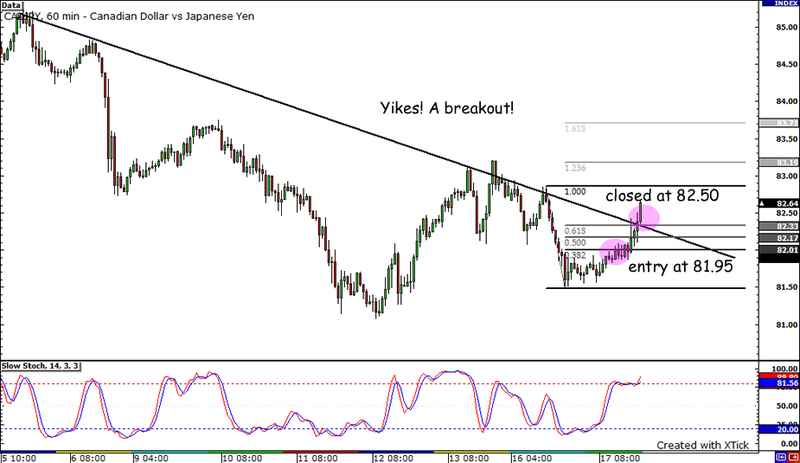 Short CADJPY at 81.95, stop loss at 83.30, pt1 at 81.00, pt2 at 80.00. Wish me luck and don’t forget to hit me up on MeetPips.com! Rest assured, I’ll be watching out for the actual results of the reports from Canada so I can make the necessary adjustments on my trade. Stay tuned!